The results of the study and hand strongly suggest, but don't finally prove that a brief leg-focused HIIT like spinning will not impair your biceps gains even if it's done immediately before weight training. You will probably have read about the problem that doing endurance before or immediately after resistance training will blunt the protein synthetic response to exercise. In fact, I have written about this topic repeatedly. The latest article was published only two weeks ago ("How Much Cardio Messes W/ Your Weight Training Results Depends on Recovery Times: Cardio + Weights in One Session vs. AM + PM Training vs. Doing Each on One Day" | read more). Now, a recent study from the Swedish School of Sport and Health Sciences shows that the question whether "cardio" in the broadest sense will interfere with strength training gains cannot be answered with a simple yes or no. 1, 2, or 5 sets per Exercise? What's "best"? In their study, Moberg, et al. (2014)set out to conduct a series of studies to examine the influence of endurance exercise on the acute stimulatory effect of resistance exercise on anabolic processes. To this ends, the effect of endurance exercise on a previously inactive muscle was investigated. 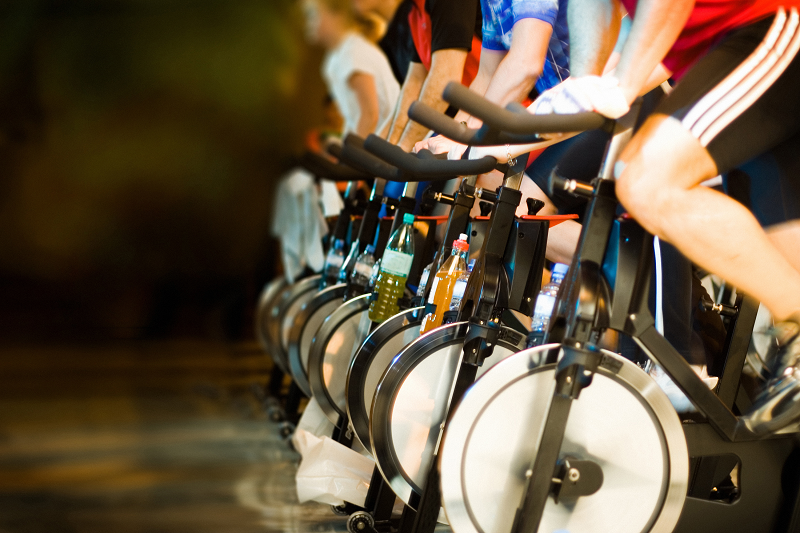 The aim was to examine the influence of resistance exercise on mTORC1-signaling and rate of protein synthesis in the triceps brachii muscle with or without preceding intervals of high-intensity cycling. 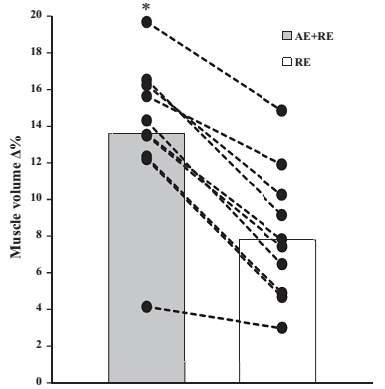 Individual and group mean increase (%) in m. quadricep muscle volume following resistance training with (AE+RE) or without (RE) concurrent aerobic exercise (Lundberg. 2013). Even in studies evaluating the effects on identical muscle groups, the results are ambiguous: While there are many studies which found negative effects of concomitant training on muscle size gains, there are also studies which found no effects (e.g. McCarthy. 1992) and studies like Lundberg et al. 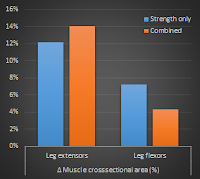 (2013) which found beneficial effects on muscle gains in a study that combined aerobic training and leg extensions in one session (see Figure on the left). It is thus unwarranted to try to give a one size fits it all answer with respect to the interference of endurance and strength training, when it comes to its effects on the amount of muscle you gain. It is important to point out that the same amount of work with regard to load, total number of repetitions and total time under tension was performed in the two trials. Figure 1: Fractional muscle protein synthesis response in the biceps brachii and corresponding changes in signalling proteins in the HIIT + resistance training (E+RE) and the resistance training only trial (Moberg. 2014). Unlike in previous studies, where the "cardio" exercise was usually a steady state exercise and the muscle protein synthesis was measured in muscles that were trained during the "cardio" and resistance training session, mostly specifically the leg muscles, the muscle protein fractional synthesis rates (FSR) in the study at hand increased from 0.050 ± 0.006 %/h at rest to 0.078 ± 0.008 and 0.082 ± 0.0016 %/h following E+RE and RE, respectively, with no difference between trials. The same goes for the signalling protein AMPK and eEF2, as well as for the alleged protein synthesis gauge mTOR which was increased by 76% and 108% above rest directly after the E+RE and RE, respectively, and remained elevated in both trials during the entire recovery period. Figure 2: McCarthy (1992), like Lund- berg (2013) found no negative effects of concomitant strength and endurance training on muscle strength and size gains (see above) in their 10 weeks training intervention - despite the fact that the strength trained muscle was also the muscle that was used during the aerobic activity. Bottom line: As Moberg et al. point out in the conclusion to their abstract to a conference paper, "[h]igh-intensity endurance cycling does not influence the acute stimulation of anabolic signalling and muscle protein synthesis in the triceps brachii following resistance exercise". Practically speaking, this means that despite non-significantly lower mTOR levels in the HIIT + weight training session (E+RE) the protein synthesis in your biceps or other muscles that were not used during the previous cardio training will not be impaired. Obviously, it remains to be seen, whether this means that you can gain the exact same amount of muscle with concomitant training vs. weight training, alone. In view of the fact that not all studies found differences, it appears not totally far-fetched to assume that the interference may depend on the type of aerobic activity and the muscles that are involved | Comment on Facebook! Lundberg, Tommy R., et al. "Aerobic exercise does not compromise muscle hypertrophy response to short-term resistance training." 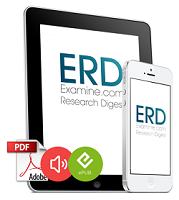 Journal of Applied Physiology 114.1 (2013): 81-89. McCarthy, J., et al. "Combined strength and endurance training: Functional and morphological adaptations to ten weeks of training." No. NHRC-92-26. Naval Health Research Center San Diego CA, 1992. Moberg, Marcus, et al. "High-intensity cycling performed prior to resistance exercise does not influence mTORC1-signaling and the rate of muscle protein synthesis in the triceps brachii." 19th annual Congress of the European College of Sport Science, 2-5 July 2014, Amsterdam The Netherlands. 2014.